We sow buildings and harvest them on the spot. What is there is used. When you need more space, you simply let the building keep on growing. When winter comes your building develops a layer of fur. On a sunny day the walls become transparent and let the warmth in. As a storm approaches the building is getting itself prepared. Lets imagine we live in a building that has emerged from biological and technological processes. A building that initially finds its construction site through self-organization, already fulfills a function when the foundation is laid and can be used while it is growing. It can adapt to climatic conditions and grows when more space or a stronger structure is required. It produces no waste while growing and while being constructed, and it can disassemble itself when its lifetime has expired. Of course, it is equally conceivable that such a building can keep indefinitely with the help of suitable methods and remain adaptable to new functions. The building would be able to accommodate a constantly growing number of inhabitants in an urban setting. Similar to a tree, the spectrum would be limited but adaptions would still be possible. 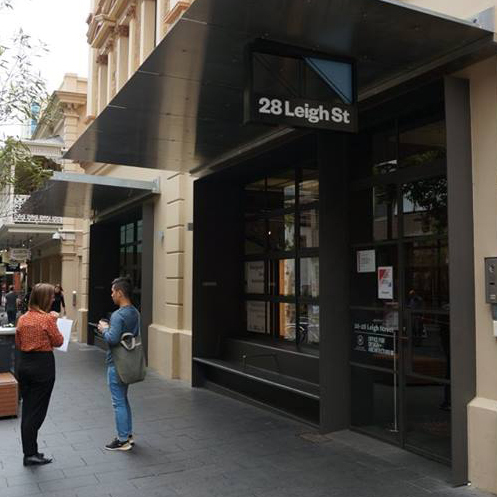 Such a building could merge with others to create urban structures and thus function as part of a larger organism, like the way the Metabolists of the 1960s conceived of the city as an analogue model. With the growing urbanization of our habitats, it is becoming ever more visible that the city is man’s true biosphere. Ever more attempts are being made to integrate nature in our built environment. Smart building shells, which react to and interact with their environment and users are already part of today’s scenario along with the cultivation of vegetables, wheat or fruit trees in urban space. Intelligent control systems, alternative concepts of mobility, moving building parts, a scenario resembling that which Archigram drew already fifty years ago, inform our future visions of urban architecture today. Here sustainability, renewable energies, alternative building techniques based on new computer-controlled production methods, refined materials and interacting digital systems all play an important role. As a result of the idea of a living architecture the paradigm of biology has become indispensable. Nonetheless, today’s building technologies show little signs of these approaches actually being implemented. A building is constructed one step at a time with tools being used to add material layer by layer. On an experimental level of work, new methods of production are finding use in architecture, which allows for another approach to be used for constructing spaces. In nature new structures are generated in growth processes that are fundamentally different from our present production processes. Growth, like order and metabolic rate, is a sign of living organisms. 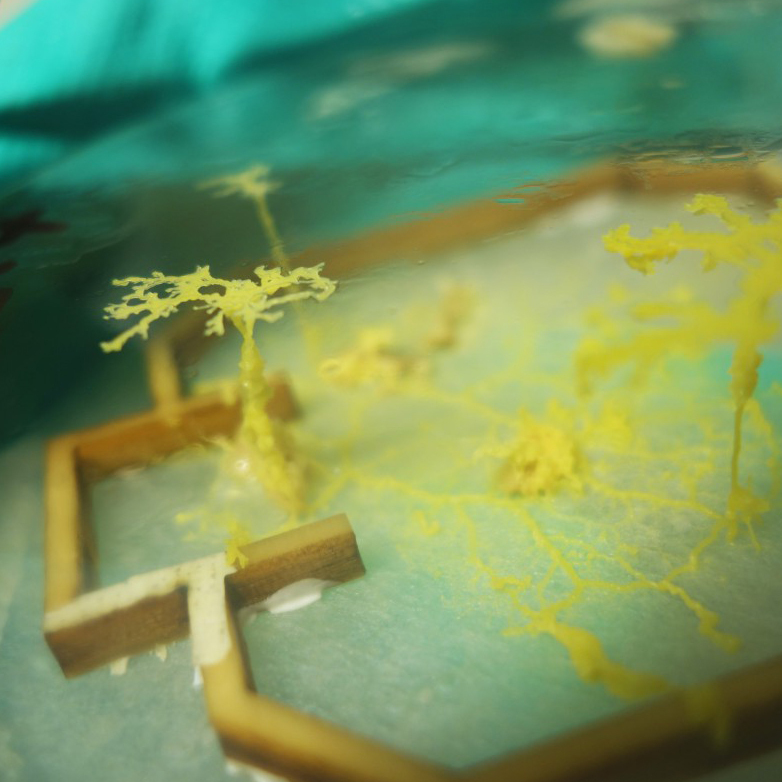 The goal of the PEEK project GrAB - Growing As Building is to make use of these differences between biological and technological processes of growth and to develop proto-architectural examples of a new living architecture. GrAB is a two-and-a-half year project at the University of Applied Arts where also the previous project Biornametics was located. GrAB has brought an interdisciplinary team from the fields of architecture, biology, art, mechatronics and robotics to Vienna in oder to initiate a process of transfer in which models from nature are applied to architecture and art, similarly to the Biornametics project. The method of bionics (biomimetics) is used to work strategically with models from nature. In GrAB specific biological processes of growth are studied in-depth. Principles that have been identified in natural models in the course of the research work are to be implemented in exemplary architectural ideas. At the same time, architectural visions and concrete issues serve as a point of departure for finding ways to implement these on the basis of growth principles found in biology. The last decades have witnessed the evolution of dynamic and organic forms in architecture, inspired by the biology, mathematics and digital image processing. GrAB focuses on dynamically growing architecture which can adapt to the environment and the needs of users in a process of constant evolution. In the last hundred years, deciphering growth processes and generating forms has been a focus of the life sciences. It is only with the emergence of computer technologies that these scientific findings have been integrated in architecture and design. In organisms growth takes place on a cellular level, allowing for exponential increases. Growth processes in organisms are genetically controlled, including the basic principle of self-organization, and are also significantly influenced by outer environmental factors. This basic principle is the key to adaptive growth. In complex forms of life growth is also characterized by differentiation: Cells have various sizes, forms, metabolisms and reactions to certain signals. Differentiated cells work together to generate greater functional units such as tissues and organs. The basis of all growth is metabolism in a stable environment, which finds itself in a flux equilibrium. As opposed to this, technical products are usually manufactured by means of subtracting material. In these processes (sawing, die-cutting, milling, etc.) often a lot of waste is produced. The individual elements are very simple and refinement in the sense of increased complexity is not achieved due to economic reasons and because of insufficient technologies. Interaction with other processes is not desired since this could disrupt the control of production. A high expense of energy is required for producing materials. In sum, our present production methods have a very negative impact on our environment. It is clear that given he weaknesses of conventional methods it makes sense to learn from living systems and to put these insights to work in architectural applications. For us growth means an increase in material and/or space. In architecture growth is primarily understood to be an expansion of space in the sense of deployment or as the use of plants to build building-like structures. Other possible options are the integration of plants in built space or growth on a virtual level of architecture. In architecture growth can appear in different scales. In the area of urban design growth processes can be very easily compared with those found in nature. We are just beginning to integrate growth processes in the scale of the design of buildings or material systems. In recent years there have been significant developments, in the field of nanotechnology in particular, to use processes of self-organization for generating materials and surface structures. 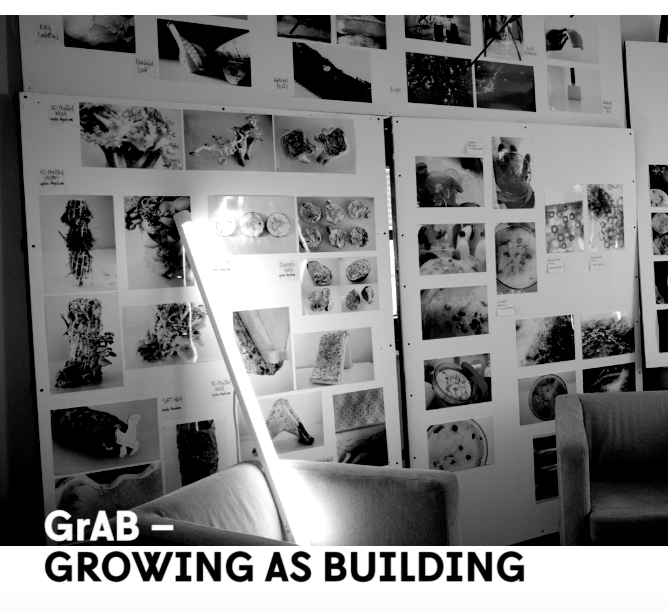 In GrAB-Growing As Building we are trying to approach the scale of buildings and material systems and to combine the methods and approaches of biology and technology. Here we are backed by a biolab in which work is being done with both organisms and technology on a lab scale as a kind of experimental platform. In three workshops organized by the GrAB Team and architecture students from the University of Applied Art, GrAB will expand the fields of bionics, architecture and art. Design concepts for a growing architecture which will include a proto-architectural installation and the relevant scientific publications, will be part of this project. With all of this we strive to get closer to the scenario of the growing building described at the beginning of this article a reality in the near future. Publication as part of the newspaper Wiener Zeitung 03/2014 and on the occaison of the exhibition of “Out of the box” in the Museum of Applied Arts Vienna.